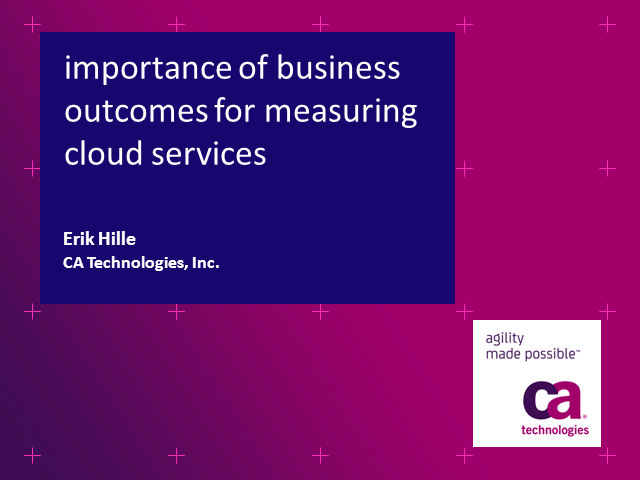 With many organisations looking to gain competitive advantage while simultaneously saving cash through cloud based technologies, how can you be sure that service quality will not be compromised in these austere times? In this session we will be looking at how through the use of "business outcomes" the paradigm of delivering more with less can really be achieved. Erik Hille, Senior Principal Product Marketing Manager, CA Technologies. Presented by: Erik Hille, Senior Principal Product Marketing Manager, CA Technologies.